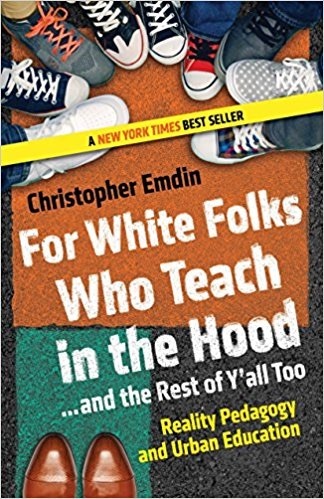 For White Folks Who Teach in the Hood…and the Rest of Y’all Too by Christopher Emdin explains how teachers from different cultures can connect and foster success when teaching black students in poor urban schools. While aimed at black cultures found in the inner city, the advice here applies to anyone teaching students from a cultural background that is not their own. In addition to the targeted audience, I strongly recommend this book to all teachers and their administrative leaders. Leaders of teacher preparation programs should also seriously consider this book. Chris compares the urban poor black students to indigenous people like native Americans, who have suffered from the impact of colonization. He invented the term neoindigenous to describe his target population. The key idea in the book is how do we help white teachers better understand the culture of the black students they teach rather than spending their time trying to take their culture away from them. Strong discipline seems oppressive to many students and gives them the feeling that school is not for them. Harsh treatment is unlikely to produce academic success. The behavior students bring can make white teachers uncomfortable unless they are prepared for what they will face. They should become familiar with student culture including clothing, music, and speech. Viewing hip-hop as vulgar, for example, is a good way to make sure a teacher fails to connect. Students see a curriculum that is not connected to their culture and school rules that seek to erase that culture. Teachers in urban schools are usually from different neighborhoods and classes and don’t look much like their students. Unfortunately, they don’t see this as an impediment when it comes to engaging students. They can come in to save the students, which can make student experiences, emotions, and communities invisible. Teachers need to visit the community where students live and leaders need to facilitate visits. These students are often traumatized so it’s vital to get an idea of the nature of the traumas they face. Teachers can’t expect students to leave their experiences and emotions at the door. Even poverty comes with complexity. While you don’t have to use student vocabulary, it is important to know it. Teachers need to see students as individuals and meet them on their own cultural and emotional turf. Watch out for code words like “these kids” and “those kids.” Black youth see white teachers as enforcing rules that are unrelated to teaching and learning. They often respond negatively to structures that teachers value at the expense of their academic success. Chris tells of his days as a student and rookie teacher when he was urged to take emotion from learning and teaching. This mantra served to mask fears. Too often white teachers become test-prep machines. Even teachers with good stories are apt not to tell them for fear of getting too personal. They also may avoid hands-on activities for fear of what students might do. Even Chris had an initial fear of students, which kept him from moving beyond fear and getting to know them. This entry was posted on Thursday, July 12th, 2018 at 7:02 am	and is filed under Book Summaries, Education Books, Leadership Books. You can follow any responses to this entry through the RSS 2.0 feed. You can leave a response, or trackback from your own site.